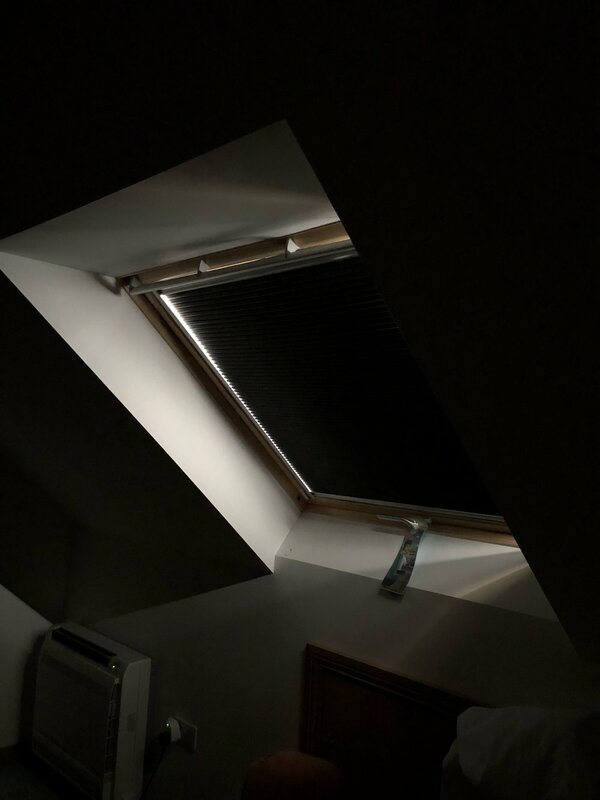 In 2015 I installed Velux "Energy" Blinds in our self-build house. Since the house is 1.5 storey - i.e. the upper rooms are in the roof space - it seemed like the extra insulation over and above normal blackout blinds would be a good idea. Now, the thing is, at the time these blinds, although made of blackout material, did NOT claim to be blackout blinds, due to leakage round the edges. So, all credit to Velux for at least being honest. You can see opposite what this leakage typically looks like. Now, in reality, for the six darker months of the year it's not a massive issue (especially in Scotland) but during the summer months, with stronger sun and earlier sun-rises it did become a bit of a problem, to the point where I actually crafted some 'drapes' to stick over the window frame, made from blackout fabric. Frankly, it was all a bit of a palava, and actually stopped us using the windows properly; so I had been constantly racking my brains for a better solution. In truth, I don't know if Velux are now on mark 2 blinds, or some other number, but come summer 2018 I was browsing their website and noticed that the original energy blinds had been revised, and now claimed to be full blackout. I emailed Velux to check, and sure enough, they had updated their blinds. If you shop around hard enough on the internet you can find them with around 30% off the normal retail price, but they are still not cheap. None-the-less, it seemed like a solution to our problem, so handed over my hundred-and-odd notes in return for a new version blackout blind. The room has two, but I figured I would test one first. The New Blackout Energy Blind is extremely effective. Sure enough, they work a treat. And while they don't (can't really) achieve 100% block, it's almost 100% and extremely effective - as you can see from the comparison picture. In fact it turned out it was quite easy to fit, and I didn't even need to replace the blind, just carefully replace each side runner with the new ones, which now come with a flexible rubber baffle that provides the light blockage. 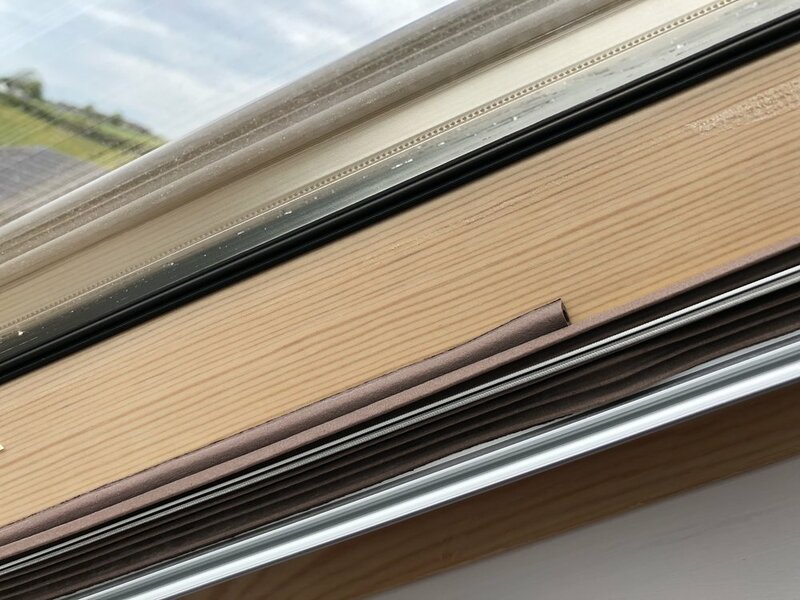 If my 100-and-off notes had essentially just bought me a rubber baffle down the side runner, could I not come up with something similar myself for the remaining window that would save such a large outlay for such a small change? Well, I did indeed concoct a plan using some rubber draught-proofing material that I'd bought reasonably cheaply on ebay. For old time's sake, here's another "before" picture to enable a comparison. stick the E shape draught excluder down the side channel of the blind, flush with the front lip. So, here are some step by step instructions for what I did to save me well over £100 in replacing my second blind. You need suitable lengths of rubber draught insulation - both the "E" shape type (it has ridges in it) and also the "P" shape type (usually specified for blocking gaps of around 5mm). Colour is your choice, but crucially the "E" type I have bought has always come as a roll of two pieces joined side by side, which are intended to be pulled apart and used individually. DO NOT pull them apart! The first step is to stick the "E" type excluder strip down the side of the side-runner, behind the string. See pictures. One key thing to note is: only stick down the forward most part of the strip (remember it's a double strip); leave the rear most part with its backing protector on. peel and stick as you go - don't try to peel everything off and then stick it all on at once. As with all good "sticking-on-a-long-sticky-thing" practice, don't peel the back off all at once. Instead peel a little, stick a little and then align-stick-and-peel as you go by pulling the backing off gently, bit by bit. Just take your time, bit by bit, aligning the rubber, and gently peeling the rear off in order to stick it. The finished result - just to get the message home about aligning the excluder first, then peeling off protection from behind in order to stick it. This is phase 1 complete - and originally I was going to stop here. If you look at the photo, you can see that this has produced a significant improvement. Sure, still some leakage at the top, but a hug reduction in the overall leakage non-the-less. Apply the "P" strip behind the unstuck part of the "E" strip. Phase 2, which I suppose is optional, but in my opinion well worth it, is to apply the "P" shaped excluder, The idea is to apply it behind the unstuck part of the "E" excluder in order to press it against the side of the blind. In the pictures you can see i started by applying the "P" strip with the "tail" of the "P" behind the first strip, but in the end decided/realised this didn't really press it outward enough. So I switched to applying the "P" strip the other way round, with the "head" of the "P" underneath the "E" strip and pushing it further outward. This forms a much better seal against the side of the blind. The end result is pretty impressive. The picture is a bit lousy because actually the phone was struggling to focus. While it has adjusted the exposure to compensate for the lack of light, you can see that if you compare it even against the phase 1 result, the strong triangular leaks at the top side of the blind are gone. The leak at the top is rectified by ensuring the blind frame is screwed tight to the window frame. The blackout effect is not as perfect as the new style blind, but it is easily 80% - 90% as good and 10% the cost! It is a massive improvement over the "non-baffled" blind. 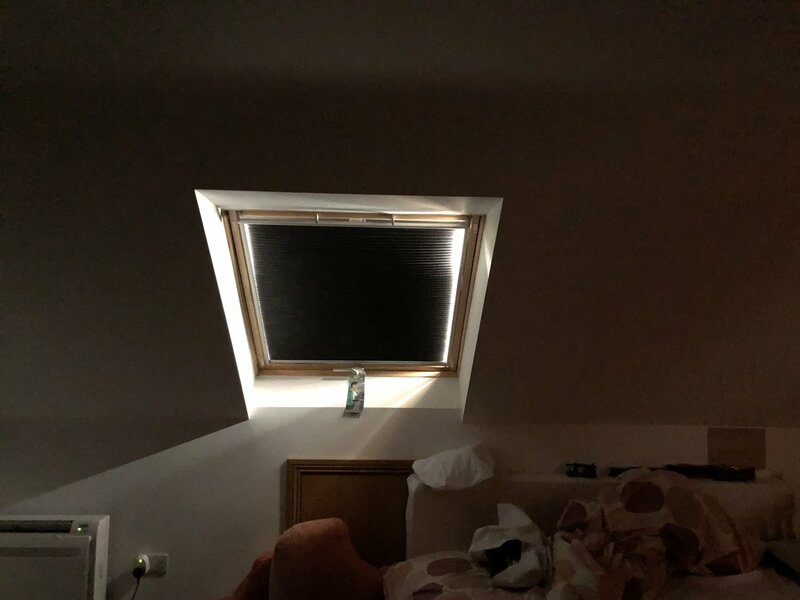 The good news is, the blind can still be operated as intended, though i recommend a little extra care as the draught excluder rubber offers up a bit more friction than its equivalent Velux baffles. You have no guts, man. The fingerprint of a scam. I got a call from 020 0982 3420 this evening from someone "authorised by Microsoft" offering to scan my PC for all manner of unnamed things that apparently make it run badly. I kept "Paul McKenzie" (with an Indian Accent) talking for about 25 minutes with the lure of 6 or 7 PC's to fix, knowing full well this was a scam. I know it's a scam because a family member fell prey to it in 2010. And by how my call ended. It is a well executed scam, very well executed actually; these folks have all the answers and play out a very convincing story. But, in the final analysis, when you consider that someone is prepared to stay on the phone for 25 minutes to make a sale of "PC healthcheck", something smells fishy - around about the 3 minute mark actually. I stuck it out with this guy for a couple of reasons. One - just to save someone else being caught - my 25 minutes on the phone might have used up time scamming 3 or 4 other people, so it was part community service. Two - I also wanted to get a full sense of how they operate. I certainly got that. The chap then started referring generically to my PC. Rather than ask how he knew I had one (he, doesn't by the way, he's guessing; and if you ask the question he'll say it's the error reports you get from crashed programs), I asked which one. Pause. The one with windows on. Yeah, doesn't really narrow it down does it? Which windows? Err.. either windows XP or Vista. So immediately I know he's fishing, I own neither. This is almost like getting a psychic reading. He proceeds to ramble on about windows auto updates and how it downloads junk and my computer is full of it and do I want a healthcheck. I play along. I say I am recording the call. He says he doesn't mind, which proves he is reputable - a scammer would hang up, he says. I say I know what's going to happen - he'll get me to download something and access my PC. Evasion. I question his identity - he says he is a partner of microsoft, sort of implies doing it on their behalf. I push the whole identity thing and he takes me to microsoft's website and claims to be SB3 INC. Would microsoft allow a disreputable company on their website? When I question that I have no proof he is SB3 INC he says surely I trust microsoft. That an intelligent person would realise that a company associated with microsoft would not be disreptuable. I don't disagree, but my question is about proof he is SB3. And he insulted my intelligence; that raised the stakes. He says he is my system admin and he is just trying to help. I say what? Do you access my PC without my permission? No, he just wants to help. Just a check, like going to the doctor, then you buy the medicine. (Good of him to spell that out for me). He just wants to check my PC for bad things, what would a reputable company do that's bad? I say, you could install a keylogger and get my bank details. He repeats, why would a reputable company associated with microsoft do that? I push the "prove you are SB3" line and he suggests I look at the SB3 INC website. I say this is not proof. I say I could tell him I'm from HP and show him an HP webpage - what does it prove? Backed into a corner he asks what proof I want? I say it can't be given - what I'll do is call the SB3 number. He says Ok, he'll give me the number so I can call back and speak to him. I say no, I'll call the number on the microsoft site that I DO trust. He insults my intelligence again and asks why I don't trust microsoft. Calmy, I again explain to him that I do, but I don't trust him. In the end I force this point and he says "you have no guts, man; you have no guts" and disconnects. I guess mr unintelligent here outsmarted him. Let me tell you - his persistence was wearing and convincing. I can see how it would be ever-so-easy for someone to be socially engineered into following his instructions. When you step back and analyse it, however, the whole scam revolves around the association with microsoft as a claim to be reputable (I hear all the Apple fanboi's - and a few others - sneer in the background!). The point is, at no time is there any proof of his identity, no proof of that association. This is where they trick people - they labour that point, state it as if it is fact. That's what convinced my family member. NEVER, EVER, EVER buy something if you are approached by someone you cannot verify - this applies as much to the doorstep as it does to the phone. If you get an incoming sales call, leave the decision to later. Make it your policy. Tell doorstep sellers "I never buy on the doorstep; leave me your details and I'll get back in touch". NEVER! NEVER! NEVER! The second thing is to realise something about microsoft: this is not how they operate or authorise anyone else to operate using their brand. Furthermore, this is not the market that microsoft partners are in. MS partners are business solutions partners - they create systems and integrations for business, using email, instant messaging, sharepoint, communications, and all sorts of stuff that if you haven't worked in a big IT department will probably have never heard of. Microsoft retails through the usual channels to consumers, but it does not sit behind this kind of consumer support. Finally, make sure your computers are up-tp-date with virus checkers, windows/operating system updates, and run regular scans for malware. This is just as good as what these scammers can do - and the truth is, they don't even do that properly - it's a subterfuge to get you to pay for their services. It's all about impression. Be warned. I've just completed my second of 3 (ultimately) upgrades from windows XP to windows 7. For the first machine i just followed the standard Microsoft line and did a custom install "over the top" of XP. This takes your existing setup and stores it in a windows.old folder on the new machine running windows 7. You are then free to do with that folder what you will (such as delete it). This was ok on my first laptop as I'm just using it as a windows 7 media centre - didn't need my old stuff. Thus the promise of a smooth migration, keeping all the existing XP setup alongside windows 7 was sufficiently tempting for me to take up. The system is called zinstall XP7 and you install it after you have done your windows 7 custom upgrade (keeping your old files in windows.old). When you install zinstall it wraps up all those old files and creates a fully functioning virtual machine of your old installation. Absolutely everything remains intact, all programs work correctly and all data is preserved. In use the system places an icon in both the windows 7 system tray and the XP system tray (is it just me that finds it quite clever it can install itself into an operating system that has been replaced?). Double clicking this icon allows you to switch between windows 7 and XP. XP is displayed full screen, even though it's running in a virtual machine and could theoretically run in a windowed container (I intend to try this). Presumably this is to make it less confusing for novice users - zinstall describes its mode of operation as "TV Channels" - which makes it easy to understand. You can copy and paste between each system with ease, and see the file system on each system for moving files between the two. So what's the point of all this? Well - it means you can get windows 7 up and running, but keep your old system running in parallel - allowing you the time (as long as you want) to re-install and move applications and data to Win7. And if you have applications that will only ever run on XP, then you can keep them running indefinitely. It should be noted this is not the same as Microsoft's own "XP Compatibility mode" which consists of their own VM container ("Virtual PC") and a specially licensed copy of XP to run in it. The hardware requirements for their solution are stricter and you get an empty XP which you have to get your programs and data back into. This compares starkly with zinstall which is a one-click process and retains everything as is. After 3 days, I'm giving zinstall a big thumbs up.